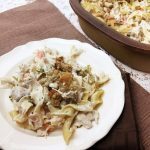 This Turkey Noodle Casserole is an easy and delicious dinner recipe. 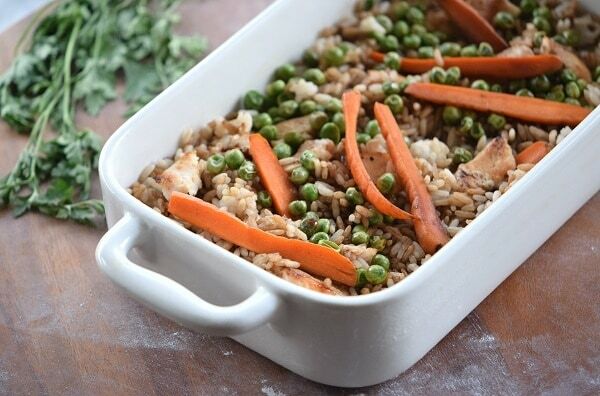 It’s a great way to use up leftover turkey (or chicken). Even better, it tastes amazing! 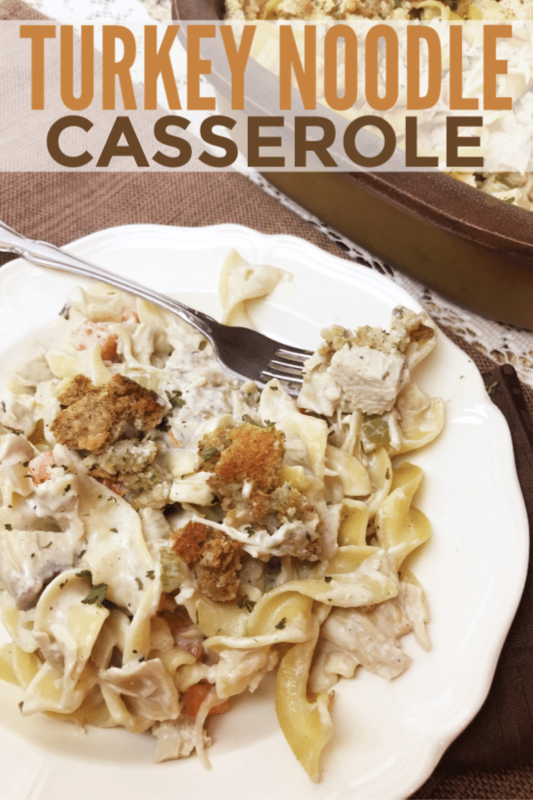 When it comes to easy dinner recipes, casseroles are one of my favorites. Throw everything together and let the oven do the rest! 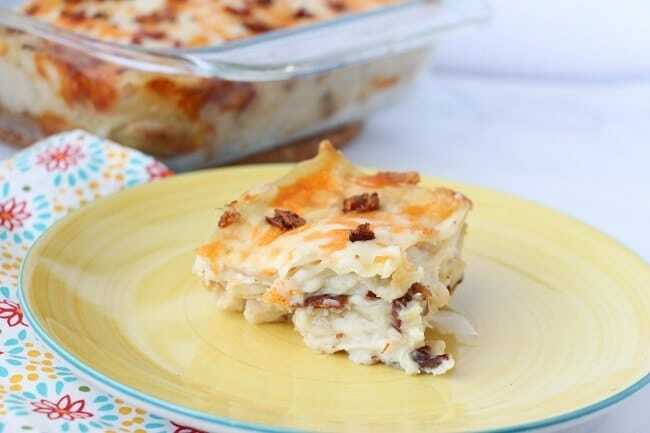 Plus, there’s something so comforting about a creamy casserole dish. It warms the soul! 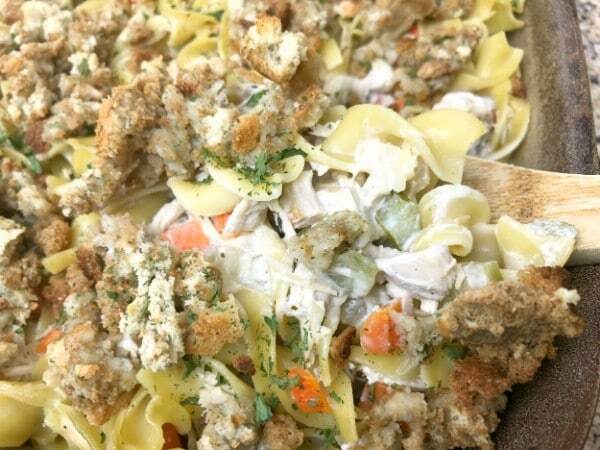 If you like easy recipes, you’re going to love this Turkey Noodle Casserole. It’s just a few simple steps! First, we need to cook the egg noodles. Follow the directions on the package. 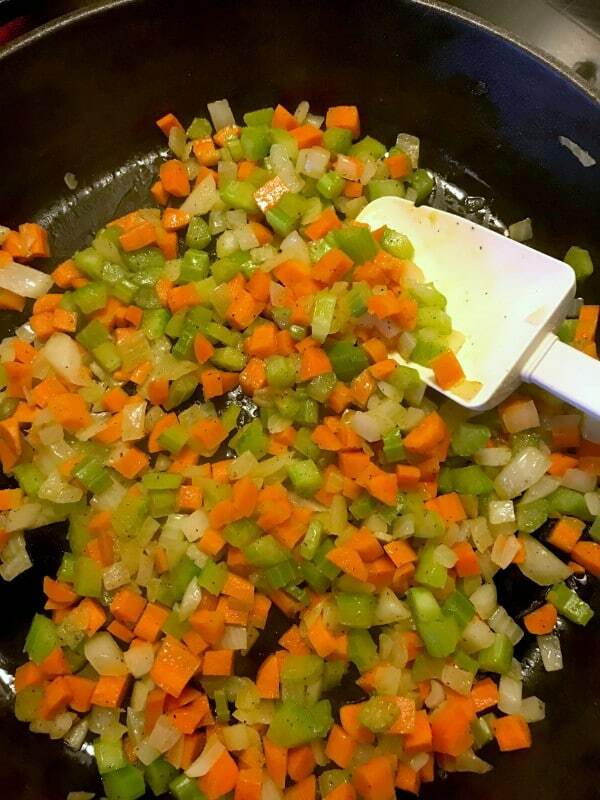 Next, saute onions, celery and carrots in a large skillet. Cook them for about 5 minutes, until the vegetables are tender. Now it’s time to add the yummy ingredients that will create a delicious, creamy sauce for our casserole. Add cream cheese, sour cream, chicken broth, sage and thyme. Stir until the sauce ingredients are melted. Then, add the turkey and stir to coat the ingredients in the sauce. 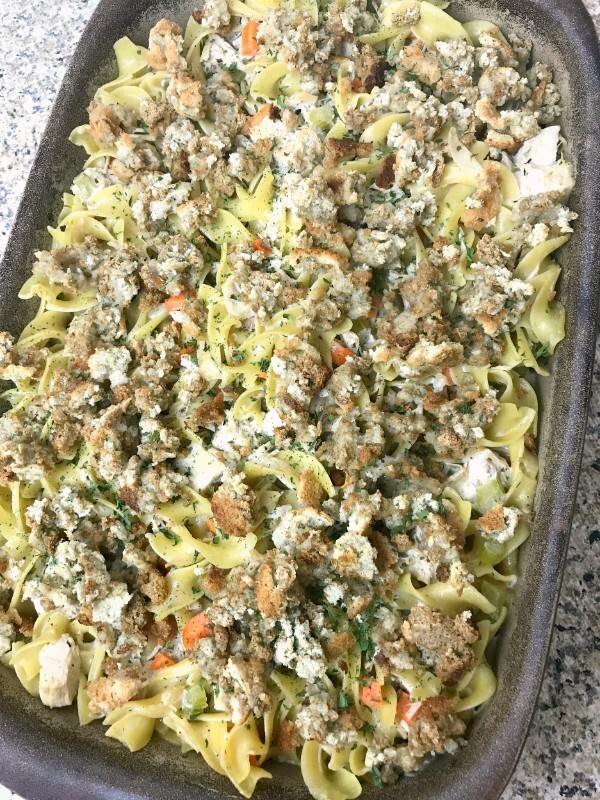 Pour the turkey, vegetable and noodle mixture into a greased casserole dish. Then, combine stuffing mix and water in a medium bowl and spread over the top. Cover the casserole with foil and bake at 350 for 20 minutes. Remove the foil and bake for another 5 to 10 minutes to brown the stuffing. That’s it! Your Turkey Noodle Casserole is ready to serve. Spoon generous servings into bowls. Serve warm. 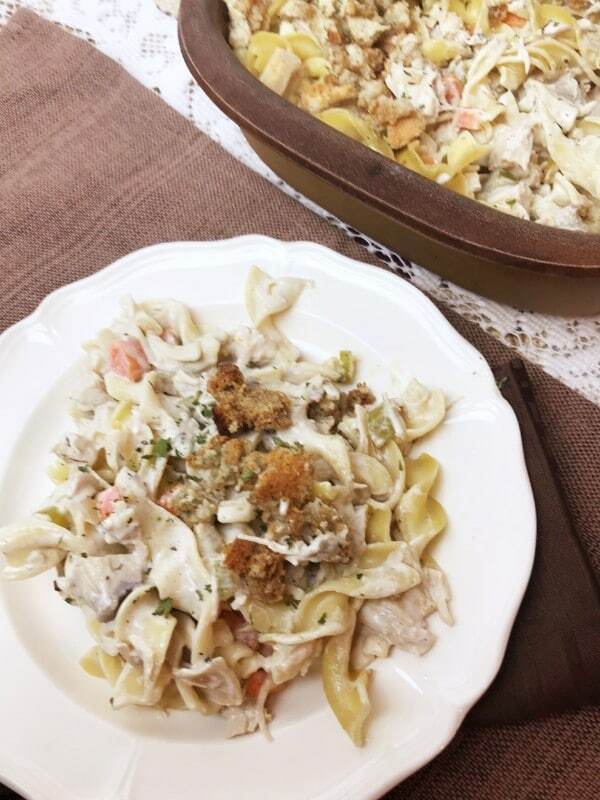 Because this Turkey Noodle Casserole is so easy to make, you’ll want to make it again and again. Bookmark this page or print off the recipe to keep in your recipe box. Cook egg noodles to al dente according to package directions. Drain. Grease a 9x13 casserole dish with butter. Set aside. In a large skillet over medium-high heat, add olive oil. Heat until it shimmers (about 1 minute) and add onions, celery, and carrots. Cook until tender, stirring occasionally, for about 5 minutes. 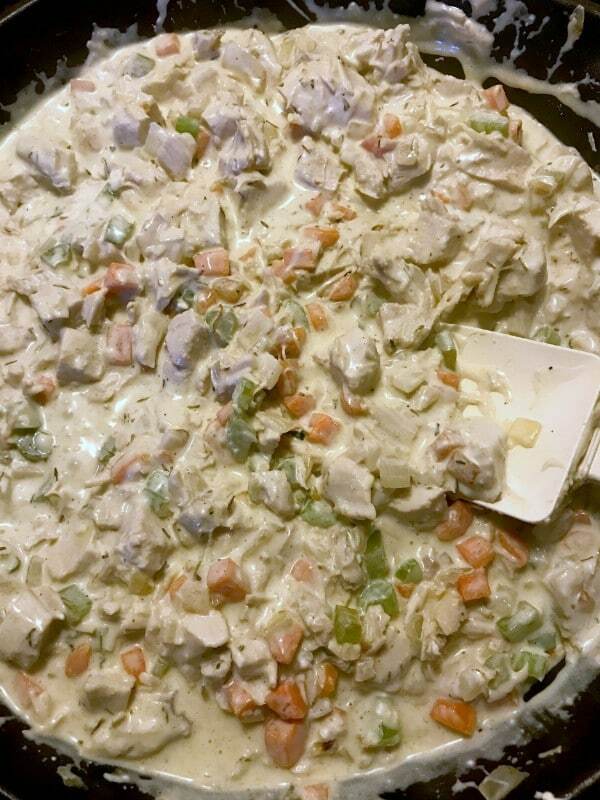 Mix in cream cheese, sour cream, and chicken stock. Add the sage and thyme. When well combined, stir in turkey and heat through. 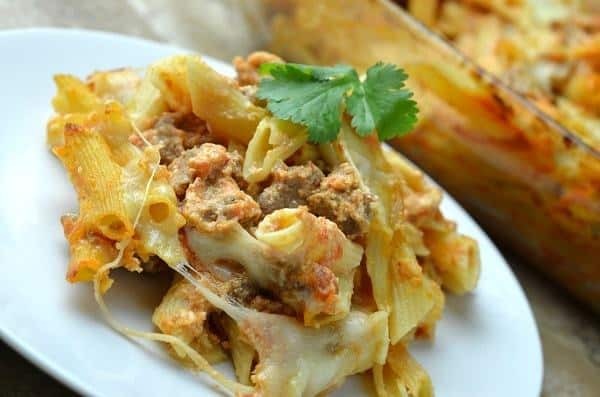 Toss turkey mixture with cooked egg noodles and pour into prepared casserole dish. Mix together dry stuffing mix and hot water. Fluff with a fork. OR use leftover dressing. 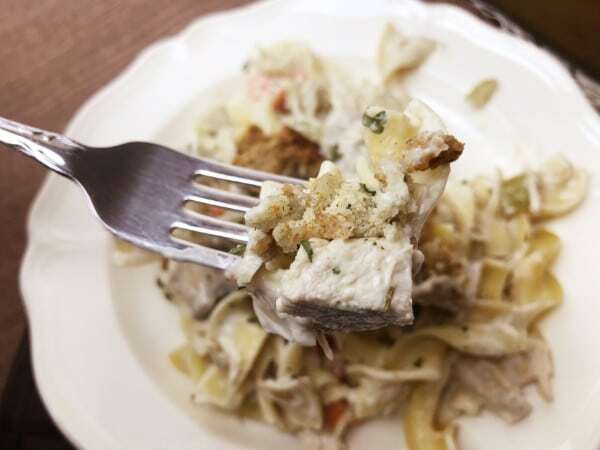 Use a fork to drop prepared stuffing over the top of the casserole. Cover with aluminum foil and cook for 20 minutes. Remove foil and cook for an additional 5 to 10 minutes to make the topping crunchy. Serve.